If I could have my way, I would be able to quit working and just cook all day long. It’s definitely my happy place. 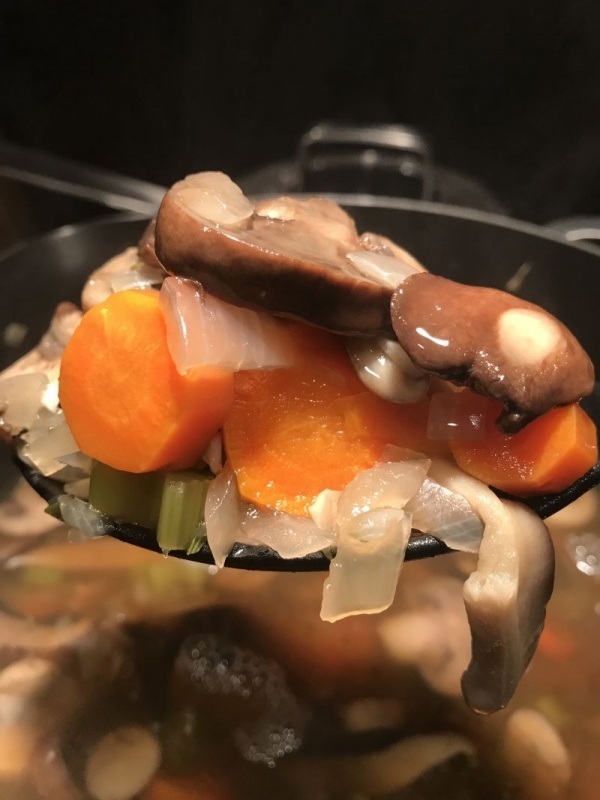 As the weather gets colder, soups are a staple here, and most days you can just show up and find something yummy being kept warm in the crockpot. Usually, it’s a cream soup of some kind, but today I decided to make a broth treat and it was good enough to share with all of you! 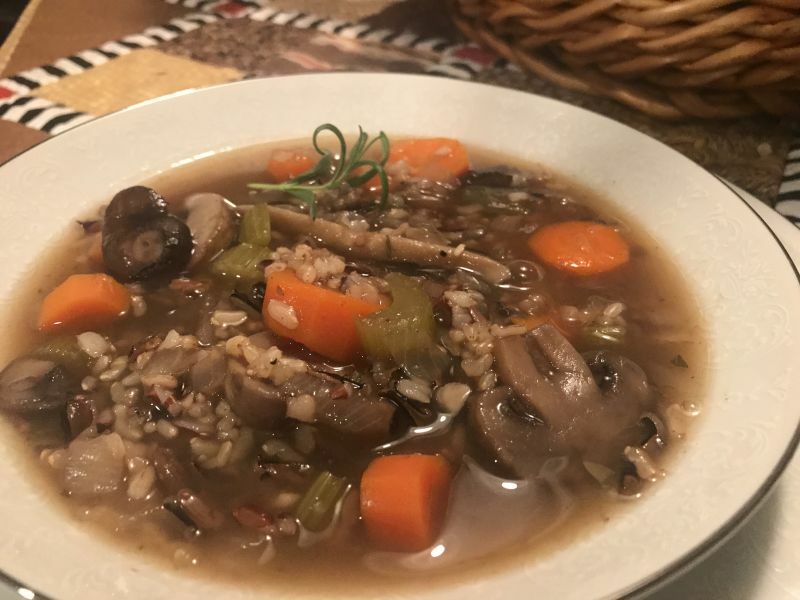 This Mushroom and Wild Rice Soup will keep you coming back for more, and is perfect with a small salad and a crust of bread. I always try to use locally produced products when I cook. Sometimes that means perusing the local farmers market for the best in locally grown produce or driving down to Corning, California for their amazing olive oils. Just south of where I live in the beautiful Sacramento Valley; famous for its agriculture. In this recipe, I would like to introduce you to an amazing family of products from Lundberg Family Farms, which is just north of Sacramento. Since 1937, Lundberg Farms has been committed to growing rice that is not only healthy and great tasting, but they are also committed to respecting and sustaining the earth. They utilize eco-friendly farming methods to harvest their rice and work hard to improve and protect the environment for future generations. What’s more, you can look them up online at www.lundberg.com and find where you can purchase their amazing rice products. I particularly love their wild rice blend, and it is what I use in today’s recipe. Something I really love about this recipe is that it doesn’t use any fats. It’s a delicious, non-fat meal! 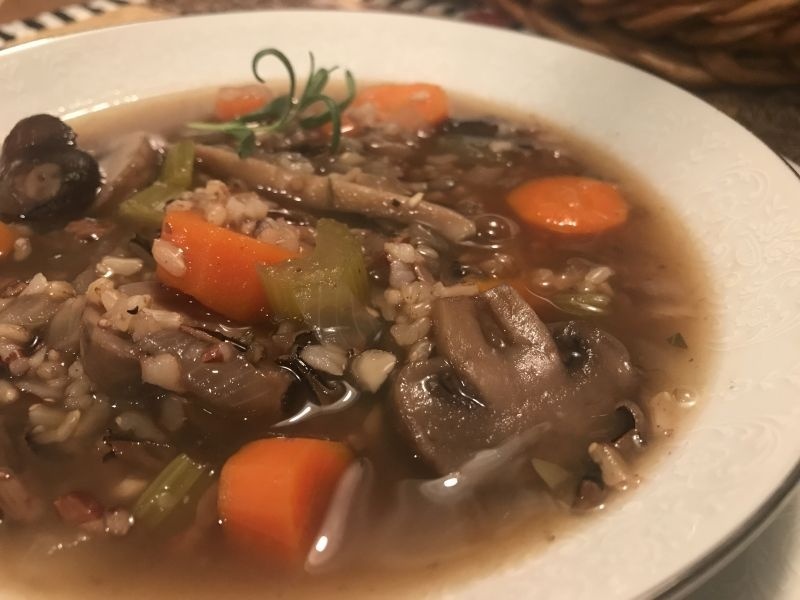 The earthy tones of the mushrooms are accentuated by the white wine, and the addition of the wild rice makes it a filling soup that can be paired with a salad or a crust of bread. I know you are going to enjoy it! Before you start this recipe, cook up some wild rice. 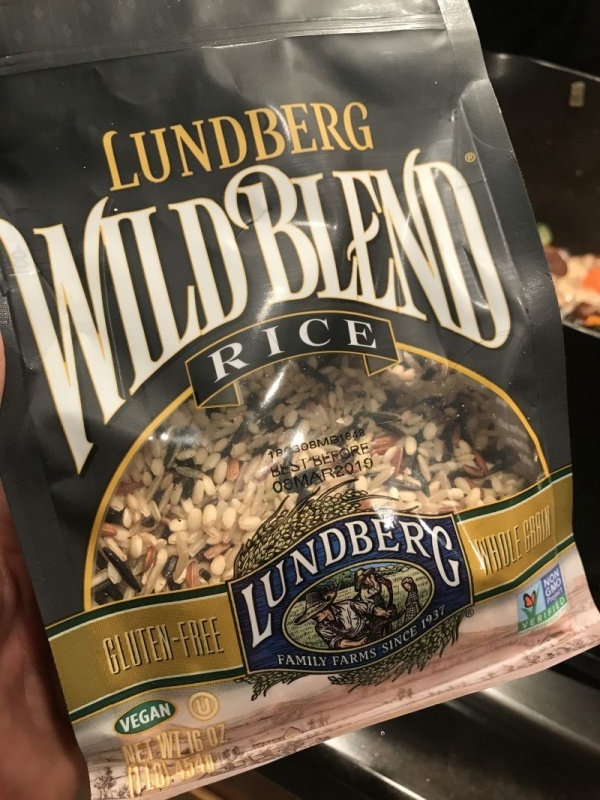 Use 1 cup of Lundberg Farms Wild Rice Blend, and 1-3/4 cup water. Bring to a boil, then reduce heat and simmer for about 30 minutes, covered. 1 large white or yellow onion, diced. 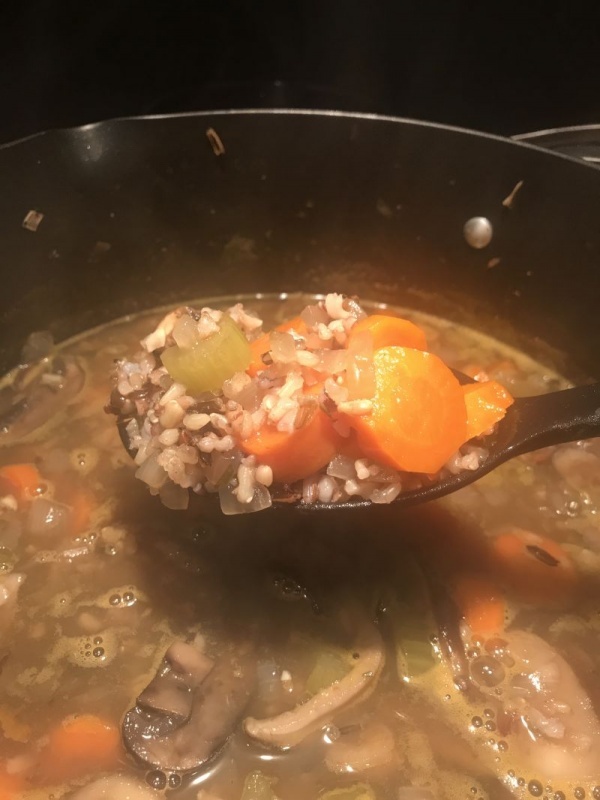 Let’s make mushroom and wild rice soup! 1. Add the wild rice to the water and bring to a boil. Simmer for 30 minutes, covered, and set aside. Rice will be firm but not crunchy. Look at all of those healthy veggies! Yummy! 2. In a large soup pot, place the chopped onion, sliced celery, sliced carrots, and minced garlic. Sauté for 5 minutes, until the vegetables are browned around the edges. 3. 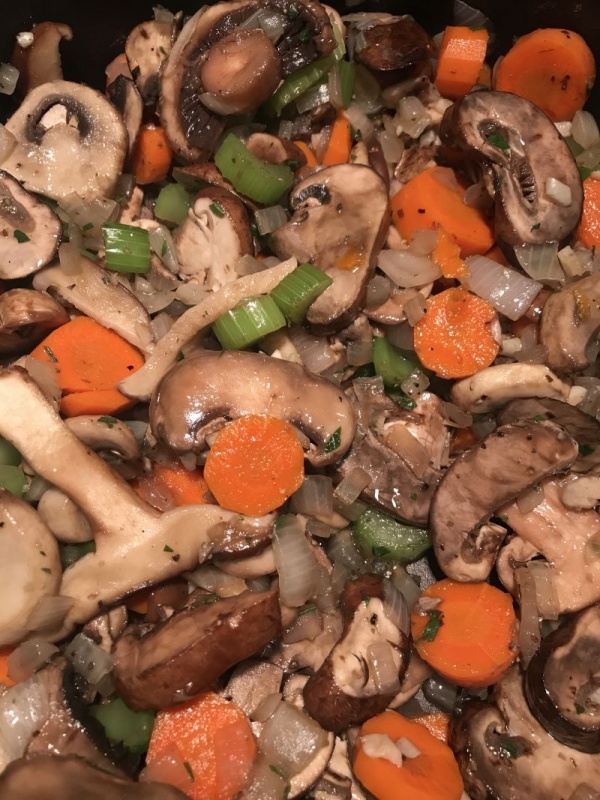 Add the sliced mushrooms and gently combine with the sautéed vegetables. Cook for 7-8 minutes, gently stirring until vegetables are tender but not mushy. 4. Add the salt, pepper, and finely chopped rosemary. Gently combine, and cook for another 2-3 minutes to allow the rosemary to become fragrant and flavorful. 5. Pour in the wine to deglaze the pot, and simmer until the wine reduces to about half. You should have the pot hot enough to “bubble” the liquids, and this should only take a couple of minutes. Soup fills the house with such amazing smells as it cooks! 6. Add the vegetable broth and the cooked wild rice. Bring to a gently boil, and then immediately to a simmer. Simmer for 15 minutes to finish the rice. Serve immediately, so as not to overcook the vegetables. If you are making a little bit ahead, turn it off, and reheat just before serving. 7. Serve and garnish each bowl with a spring of rosemary.